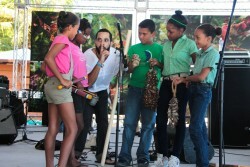 FEDUJAZZ is a non-profit foundation that provides free music education for the youth of the Dominican Republic. FEDUJAZZ, established in 2015, is a proud partner of the Dominican Republic Jazz Festival, which is now in its 22nd year. This collaboration has established a high-quality music education program and alliance that provide workshops with prominent musicians, including Latin Grammy and Grammy Award-winning artists, along with classes held year-round with local professors. A Dominican student entering the public education system has less than a 10% chance of graduating from high school (United Nations [UN], 2005). Research has shown that children and adolescents are stimulated to improve their education and learning aptitude through music. Studies have proven that children who study a musical instrument are more likely to excel in their studies, work better in teams, have enhanced critical thinking skills, stay in school, and pursue further education. The FEDUJAZZ Music program is exposing impoverished youth of the Dominican Republic, ages 7 – 18, with structured music programs that enhance their overall education and life opportunities. FEDUJAZZ currently offers its educational program to 150 local students, with music theory and lessons with various instruments. An alliance with the Art House of Sosua strings program is ongoing, and over one thousand young people benefit annually from the workshops held during the Dominican Republic Jazz Festival with the musicians participating in the festival. Marco Pignataro, Managing Director of the Berklee Global Jazz Institute joined the Dominican Republic Jazz Festival Artistic Advisory Board in 2016 and also serves as an academic advisor to FEDUJAZZ music foundation and programs. Matt Marvuglio, Dean of the Performance Division at Berklee College of Music until his passing in 2017 also contributed to FEDUJAZZ as a valued advisor. We are very grateful for both of their tremendous support and guidance as we move forward. All of the FEDUJAZZ programs create a great community spirit. By involving the whole family – parents are invited to participate in technical/professional programs, while students benefit from music lessons and workshops, the results are rewarding, bringing us closer to achieving of one of our main goals – generating social change and betterment through music. Cabarete: As of April 2015, Fedujazz currently provides over 150 students ages 7-18 with free music workshops on a regular basis in Cabarete in a permanent facility. Guitar, drums and piano instruction, as well as music education, are offered. FEDUJAZZ together with the City of Sosua and the enormous effort of Adolfo Faringthon, is currently working to provide music programs to the children of Sosua. Fedujazz/ICA is currently working to open a chapter of Music Education in the city of Santiago de los Caballeros, seeking to expand music access to all Dominican children living in this city, under the commitment and full support from our Honorary President, Mr. Fulgencio Ochoa. 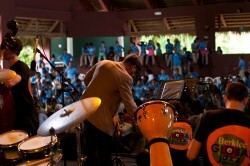 Fedujazz celebrates International Jazz Day with the community by hosting free concerts in Cabarete. The celebration is endorsed by UNESCO, with simultaneous events held around the world. Events in Cabarete feature the students of Fedujazz, and have included “Casa de Arte de Sosúa” String Program and the “Escuela Libre Monte de la Jagua” from Moca in recent years, with free concerts in the villages of the Callejón de la Loma and La Ciénaga. To stay up to date with the latest happenings at Fedujazz, please follow us on Facebook.